"I wish I had never been born ... the Mongols spared no one. They killed women, men, children, ripped open the bodies of the pregnant and slaughtered the unborn." At the time of Temüjin's birth (probably 1162) the Mongols were just one insignificant people among many who then occupied what became known as Mongolia. Dominant were the Tatars (currently allied with the powerful Chinese Jurchen-Jin) - other players included the Merkit, the Önggüt, the Kerait and the Naiman. When Temüjin's father was murdered by the Tatars, the nine-year old with his mother and siblings were forced to flee into the forests. By force of character, and inspired by his father's prophecy that he would become a great leader, he built up a following among the various local tribes, and attached himself to Toghril, Khan of the Kerait - a close friend of his father's. Together they detached the Tatars from the Chinese, and crushed them. He then put all the adult males to death to avenge his father. Vengeance remained a powerful motive throughout his life. Toghril adopted Temüjin as his successor - but they quarrelled. Temüjin crushed the Kerait. 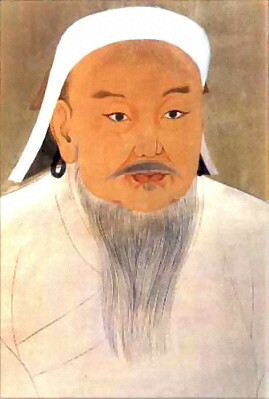 He then overcame the Merkit and the Naiman - and was made ruler of the emerging Mongol empire in 1206, with the title Chinggis Khan ("Tough Khan") - popularly known as Genghis Khan. He planned a capital at Qaraqorum (Karakorum), feeling himself chosen by the god Tenggeri ("the sky") to rule all the steppe peoples - and the entire world, as later Mongols claimed. The base of his power was his 10,000 strong fiercely loyal keshig, who looked after security, the khan's personal needs, and administration. Members were selected on merit, not birth or tribal affiliation. His army likewise was organised to minimise tribal loyalties - and the ordinary soldiers were now entitled to the booty and the spoils of war - not just the Homeric-style aristocracy. Genghis' army, into which he recruited troops from the conquered, was controlled with strictest discipline, and aimed at conquest, not just the traditional steppe nomads' swift and ruthless raiding of sedentary peoples. He created a currency, a law code and a writing system., and organised taxation. 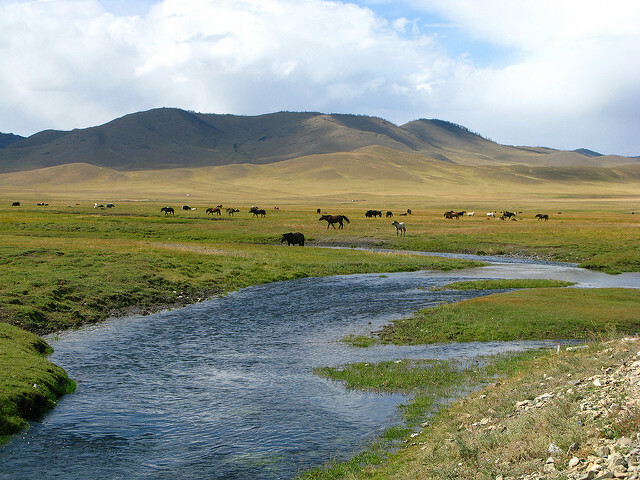 Climate change was forcing this nomadic people to find new pasture. Genghis also had a grudge against the Jurchen-Jin to avenge (they had brutally murdered a Mongol chief and relative) - and began a move southwards into China. Zhongdu (near Beijing) was taken (1215), but the final annihilation of the Jin state was after Genghis' death (1234). Muhammad, the Khwarazm shah was keen to meet him, and do business. Did the Turks go to Genghis? Or did the Mongols come to Muhammad? All sources agree that in 1218 a large caravan of Muslim merchant-envoys (450 in one account) reached the frontier of Khwarazm at Utrar. The local governor arrested them as spies - and had them beheaded, possibly on the authority of Muhammad himself. Genghis Khan was furious at the massacre - but seemed prepared to settle diplomatically. But when Muhammad put his envoys to death, an invasion became inevitable. Genghis Khan despatched an army of Mongols and Uyghurs - he had other enemies to deal with on the route. Muhammad started out to meet him, but was horrified when he saw the battlefield where the Mongols had annihilated their enemy. On news of the approach of Genghis himself, with an army of 150 - 200,000 men, Muhammad abandoned Samarkand in panic and headed west. Genghis moved swiftly into the vacuum. Bukhara fell (1220), and Samarkand - both were destroyed and their inhabitants either killed, or in the case of able-bodied young men and artisans, rounded up for transportation to Mongolia. Having secured Transoxiana, Genghis paused, and sent his generals Jebe and Sübedei to deal with Muhammad. The two generals pursued the Khwarazm shah all over Iran and the Caucasus (1222), spreading terror and mayhem everywhere. To every town they gave the ultimatum: "Surrender. If you do otherwise ... god knows." Sultan Muhammad, exhausted, died on an island in the Caspian Sea. The Mongols had conquered Azerbaijan, Christian Georgia, the Alans of the Caucasus, even a contingent of Rus' on the steppe north of the Black Sea before returning to rejoin Genghis. "The whole population was now driven out into open country, and for four days and nights people continued to stream out. 400 craftsmen and a number of children were selected to be carried off as slaves. The rest of the population, men, women and children, were to be put to the sword. Each soldier was allocated 300-400 people to kill ... those who'd hidden came out, thinking they were safe, but a detachment of Mongols, not wishing to miss out on their share of glory, massacred these 5000 remnants of one of the greatest cities of Islam." After Muhammad's death, his son Jalal al-Din took over the resistance. Despite one short-lived victory (the only Mongol defeat), he was soon on the run, through Afghanistan and into India, where Genghis caught up with him and defeated his army at the Battle of the Indus (1221). Jalal al-Din himself, however, swam the river and escaped. He returned to Central Asia, with the ambition of restoring the Khwarazm empire. He's seen by some accounts as a hero battling for "Persian independence" against impossible odds, others as a lone adventurer fighting for survival. His derring-do was admired even by Genghis, but his futile resistance came to an end in 1231, when the last Sultan of Khwarazm was murdered by random bandits in Kurdistan. A group of his loyal followers fled to Mesopotamia, where they hired themselves as mercenaries. Cilician Armenia and Georgia submitted to Mongol generals, as did the rulers of Kirman, Fars and Luristan. Mongol forces moved on into Anatolia, and reduced to once mighty Sultanate of Rum to vassal status. They had success against the Ayyubids in Syria. But the Abbasid caliphate in Baghdad held out. Genghis returned to Samarkand, having ruled out a short cut home via Assam and the Himalayan foothills. He returned to Mongolia in 1224,his mission complete, his rule over Central Asia, Afghanistan, the Caucasus and Iran unchallenged. He returned to Mongolia, where, after a campaign to punish the Xi Xia in China, he died in 1227. His empire covered northern China as far as Korea and westward to Khwarazm, the Caucasus and the Iranian plateau. Why was Genghis so successful? It was not superior numbers - the Mongols were usually outnumbered - although they often used prisoners from conquered cities to give an impression of a larger force. Their ponies, though vast in number, were weaker and slower than horses. Success rather came from planning, discipline, understanding of the terrain. Their spies were very effective (maybe Muhammad was right to suspect the merchants at Utrar!). They used propaganda and disinformation to confuse the enemy. Their communications were excellent. They could move swiftly. But above all it was due to the efficiency and discipline of the keshig. They were naturally tough and resilient from their nomadic life-style. Genghis enforced the strictest discipline - death for desertion or unauthorised looting. They were good at siege warfare - and had use of Chinese siege weapons - powerful catapults, and perhaps even gunpowder. And they were greatly assisted by the disunity of the opposition - and they had support from the start from Muslim rulers - who provided infantry to balance the Mongol horsemen. See also genetic evidence for the dominance of the Mongol elite. A Turkish people of the Tarim Basin in western China. Some had been converted to Islam in 950, although others remained Christian, Manichaean or Buddhist. They had a script based on Aramaic, which they had learned from Christian missionaries from the Church of the East. Genghis borrowed their script for his Mongolian language. They surrendered to Genghis and thus avoided annihilation. These included the Qara Kitay, who, though of Mongol origin were approved by the Caliphate, and not seen as a threat - and in fact had many Muslim Uyghurs in their administration. But when they were taken over, with Muhammad's help, by Küchlüg, whose Christian Naiman people had been defeated by Genghis in 1204, their fate was sealed. His tyranny and anti-Muslim policy meant that the Mongols were welcomed - at first. This Chinese invention was certainly in use by the Mongol armies by c 1250. Other Chinese military developments included the "ox-bow" (a huge crossbow with a range of 2,500 feet), and "naphta-machines", which fired incendiary devices. Trebuchets (an Islamic invention) could (allegedly) fire stones weighing 100- 400 kg.